Introducing the PENCIL x Kindred Studios school uniform for all artists in residence at the greatest Art School in the world. Items are recommended but not obligatory. You will not receive a detention for not wearing one, but you will miss out on looking like the awesome superstartist that you are underneath all that crippling self doubt. Please note, both items of uniform are ideal for throwing on, pre any level of pot throwing, paint brushing, focus pulling, loom weaving, candle making, lute playing, clay moulding or just popping down the shops or pub. As artists we are morally obliged to focus our creativity on our work and not on ourselves. Therefore, uniformity, or rather, WORKWEAR, is liberating. Get involved. Item one: Unisex cotton drill boilersuit with special pocket for your paintbrush and your crayons. Buy here. 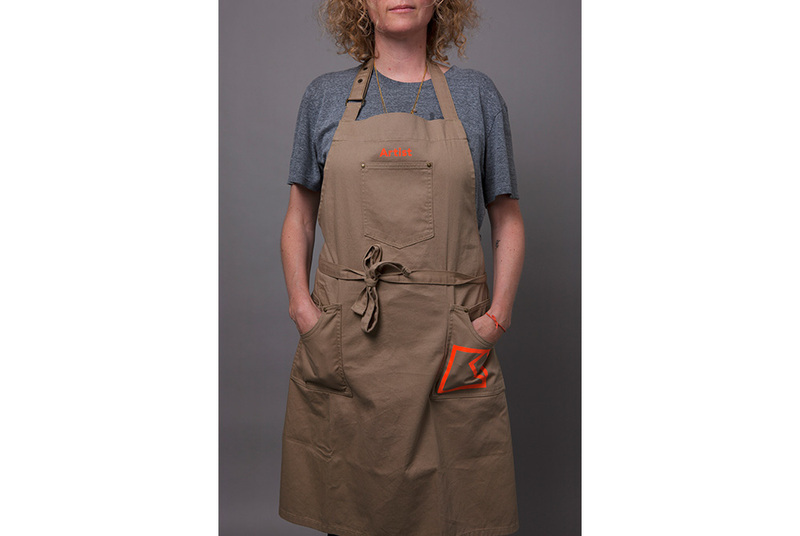 Item two: Unisex cotton drill apron with three pockets ideal for filling with random objects. Buy here. Designed by Pencil, each item has been screenprinted with the trademark Kindred Studios logo and the word ARTIST in Pencil’s loud orange colourway by fellow Kindred students, Underway studio.